Compact and classic, the Ashcott wood burning stove now comes in Ivory, Logstore and Pedestal designs ..
With autumn/winter fast approaching, now is the perfect time to consider your home’s heating needs. A wood burning stove is the ideal accompaniment to traditional radiators or underfloor heating. Not only does it give living rooms and open-plan spaces a cosy glow and instant heat, but it also provides a focal point and, with classic and contemporary designs to choose from, there’s something to suit every interior. 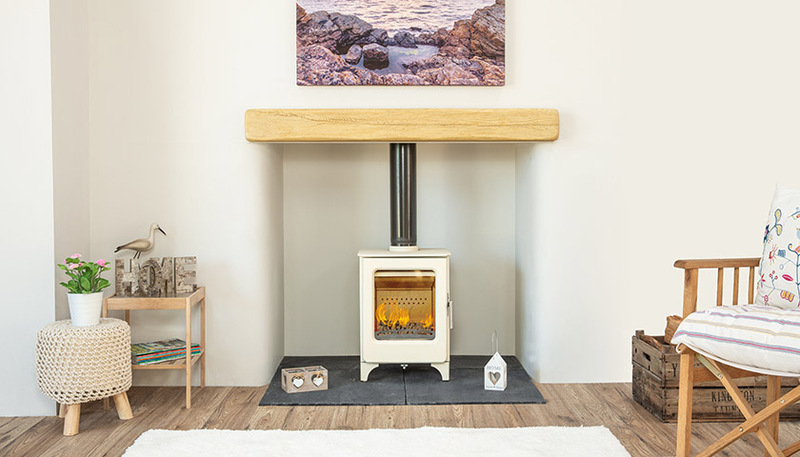 With the Ashcott model from Mendip Stoves being one of its most popular designs, the new launch of the Ashcott Ivory, Ashcott Logstore and Ashcott Pedestal is sure to please. Quality is key to the Ashcott Ivory stove design with its sturdy cast iron door and steel body. A large ceramic glass window offers an impressive view of the flickering flames inside while the convection top plate and cast iron legs enhance the traditional feel. You’ll get a clean, efficient burn thanks to the milled stainless steel air control lever while a magnetic door mechanism enables easy closing. Compact enough for smaller spaces, it still delivers a powerful heat output with 4.7kW as well as an A+ energy rating. For those who like to keep their logs within easy reach, especially during the cold, rainy winter season, the Ashcott Logstore comes with all the benefits and features of the Ashcott Ivory but with the added bonus of a handy logstore beneath the stove. And for those who favour a more modern, contemporary look, the Ashcott Pedestal comes with a pedestal rather than legs and can be used as a standalone feature for rooms without a traditional fireplace. Ashcott is also Ecodesign Ready. Ecodesign is a European-wide programme to lower emissions, which comes into force in the UK in 2022. Setting the standard for environmentally friendly stoves, the scheme is supported by DEFRA and overseen by HETAS, who will independently verify that the stoves pass the required criteria and tests. The Ashcott Ivory is priced from £995; the Ashcott Logstore, from £1,025 and the Ashcott Pedestal, from £1,025. To find out more about a wood burning stove by Mendip, please click here.